The College’s 300 acre campus, formerly the Birch Estate, combines rural beauty with suburban convenience. Located in northern Bergen County on Route 202, Ramapo is just five minutes from major highways such as I-287, the New York State Thruway, and Route 17, and is approximately 40 minutes northwest of New York City. Ramapo College’s proximity to major urban areas eliminates costly travel time while still offering a tranquil and scenic site for an enjoyable conference or event. Ramapo College has an impressive array of facilities including a performing and visual arts center with two theaters, an athletics facility with a 1457 seat arena, a conference center, a student center with multipurpose meeting space, smart classrooms, and athletic specialty fields. Cutting-edge technology is a high priority. Conference and meeting facilities include a full array of multimedia equipment, and a talented, ready-to-please conference team. Catering is provided by the internationally recognized Sodexo Corporation. 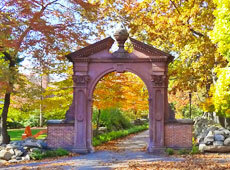 Ramapo College is located at the crossroads of the New York State Thruway, Route 17 and Interstate 287 offering easy access within New Jersey and to New York. Kennedy International Airport, Newark Liberty International Airport, and LaGuardia Airport are approximately 45 to 60 minutes away. Taxis, local trains, and buses are available to the towns of Ramsey and Mahwah, New Jersey and Suffern, New York. Ample parking is always available. Dozens of national hotels and motels are within minutes of the College along with family and fine dining options.